Occurrence: Chopped nuts in foods and as garnishes, sauces. More information..
English walnut (Juglans regia) is a tree nut of the family Juglandaceae. To this family belong also other tree nuts that are not present in Europe including Pecan (Carya illinoiensis), black walnut (Juglans nigra and Juglans californica) and butternuts (Juglans cinerea). Many processed foods may contain walnut including Sweets, snacks, baked goods, ice cream, soft cheeses. Severity of walnut-induced allergic reactions ranges from slight oral allergy syndrome (itching in the mouth and/or tongue soon after chewing and ingesting a walnut) to severe and even potentially fatal systemic reactions (anaphylactic shock; hives and swelling of the throat, asthma). Severity of allergic reactions depends on which protein(s) in the walnut the patients has become allergic to. Patients with birch pollen allergy that reacts to walnut (as well as to other fruits and vegetables). In these patients walnut allergy is the consequence of cross-reactivity between pollen allergens and similar proteins in vegetable foods. This kind of food allergy is generally mild: in most cases oral allergy syndrome (OAS) is the only consequence of the ingestion of offending food. The absence of severe systemic symptoms is due to the fact that allergenic proteins are easily destroyed in the stomach. Moreover, they are heat-labile; as a consequence, patients tolerate heat-processed foods. Patients primarily allergic to walnut and/or other tree nuts (including hazelnut, Brazil nut, macadamia nuts, etc). Proteins responsible for this type of allergy are heat-stable and resistant to digestion in the stomach; thus, patients reacting to these proteins may experience severe allergic reactions. It is very important to be aware that severe reactions may occur on the first exposure to a nut in patients allergic to a different nut. From studies in which controlled challenges have been performed it has been calculated that walnut-allergic patients have a 37% risk of reacting to other tree nuts such as Brazil nut, cashew, and hazelnut. Unfortunately, the cross-reactivity among tree nuts are very variable both in real life and when measured in blood samples and sometimes involves unusual foods such as coconut. Thus, it is extremely important that patients with a history of severe allergic reactions to a tree nut avoid the ingestion of other nuts until the absence of reactions to walnut has been unequivocally demonstrated by properly performed diagnosis. Cross-reactivity between tree nuts and peanut is frequently observed in skin prick tests or in blood samples due to the presence of similar proteins, but actual clinical cross-reactivity is very rare. Patients allergic to peach (and/or other Rosaceae such as apple, pear, cherry, apricot, plum, or almond). These patients are primarily reacting to a heat-stable protein named LTP (lipid transfer protein) present mainly in Rosaceae but also in most other plant-derived foods. Most patients have a history of peach allergy (OAS and/or more severe allergic reactions). About 50% of patients reacting to LTP react to walnut (as well as to other tree nuts) due to the cross-reactivity between LTP from botanically unrelated vegetable foods. Tree nuts (walnut, hazelnut) as well as peanut seem the most hazardous foods other than Rosaceae for LTP-hypersensitive patients. The likelihood of getting sensitized to vegetable foods other than Rosaceae is directly related to the level of IgE to peach LTP. LTP is heat-stable and resistant to digestion in the stomach; and as a consequence allergic patients may experience extremely severe reactions including anaphylaxis. Tree nuts, particularly walnut, are one of the most frequent causes of food allergy. Occurrence data are rather scarce for walnut allergy. In the United States and in the United Kingdom the prevalence of tree nut allergy is estimated to range between 0.2% and 0.5% both in children and in adults. Walnut allergy may appear early in childhood. The possibility exists that a percentage of patients with walnut allergy may become tolerant after some years of avoidance, but this is presently unknown. Skin tests with fresh food are generally considered the best way to detect walnut allergy, although commercial extracts may prove equally sensitive in patients sensitized to stable allergens. Blood samples are generally equally sensitive. As opposed to other tree nuts (e.g. hazelnut) or from peanut, walnut is rarely present as a “hidden food” in commercial preparations. Therefore, inadvertent ingestion of walnut should be rare. However, walnut-allergic patients should carefully avoid other tree nuts, such as hazelnut and Brazil nuts, unless their good tolerance has been clearly proven by reliable tests. Clinical symptoms reported by Teuber et al. (1998)  include hypotension or laryngeal oedema with or without nausea, vomiting, generalized urticaria and asthma. All had life threatening systemic allergic reactions to walnut and 2/16 individuals had had systemic reactions on skin prick test with walnut extract. In a second study, 11 of 20 Rosaceae fruit allergic patients without birch pollenosis reported symtoms with walnut. 7 patients had urticaria (one with asthma) and 4 had oral allergy syndrome to walnut (Asero et al. 2002 ). Asero et al. (2004)  also reported gastric pain, severe asthma, urticaria and collapse in an 11 year old boy on consumption of walnut. Number of Patients:Clark and Ewan (2003)  tested 1000 patients allergic to peanut or at least one tree nut. Only 1% of the 94 patients who could tolerate walnut had SPT ≥8mm. However, there was no correlation between SPT size and severity of worst reaction for walnut allergic patients. Asero et al. (2004)  report a wheal of 15 mm to both walnut and hazelnut with weaker 4 mm wheals from peanut and peach in 1 patient. 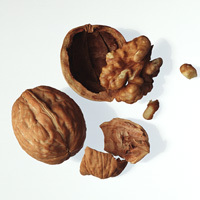 Food/Type of allergen:Commercial walnut extracts. Teuber et al (1998)  studied sera from 16 walnut allergic patients, aged 9-55 years. Sera from 17 of 20 Rosaceae fruit allergic patients without birch pollenosis (Asero et al. 2002 ). Serum from an 11-year old boy (Asero et al. 2004 ). Of sera from 16 patients, 3 gave CAP Class 2, 7 class 3, 2 class 4 and 4 class 5 (Teuber et al. 1998 ). Sera from 12/17 patients showed positive IgE binding with walnut extract. Clinical history suggested that there were 4 false negatives and 5 false positives (Asero et al. 2002 ). Serum from one patient showed strong binding with walnut extract and slightly weaker with hazelnut (Asero et al. 2004 ). Immunoblotting separation:Teuber et al (1998)  used 1D 15% SDS-polyacrylamide gels. Samples were boiled for 5 minutes in sample buffer which included dithiothreitol. Teuber et al (1998)  transferred proteins to 0.22 µm nitrocellulose membranes (Schleicher & Schuell, Keen, N.H.) overnight at 35 V by using a TE 42 Transphor Electro-Transfer Unit (Hoefer Scientific Instruments). The blots were blocked in a mixture of PBS and 3% (w/v) nonfat dry milk for 30 minutes and then incubated overnight at room temperature in sera diluted 1:5 in PBS/milk. The following day, strips were washed for 20 minutes three times in PBS/0.05% Tween-20 at room temperature and incubated overnight with 125I-antihuman IgE (Sanofi Diagnostics/Pasteur). The strips were again washed, dried, and exposed to x-ray film for 18 to 72 hours at –70° C.
In an abstract Teuber et al. (1999)  note that the use of non-ionic detergents to remove SDS before adding sera is critical for observing binding to Jug r 1 and some other allergens. Immunoblotting results:Teuber et al (1998)  report that 12 of 16 sera from patients allergic to walnuts showed IgE binding to the 2S albumin seed storage protein as a fusion protein. Bands against walnut at 14, 10 and 4 kDa are removed by the recombinant Jug r 1. Other bands are between 40 and 60 kDa. Teuber et al (1999)  report that bands at 44-47 kDa are removed by recombinant Jug r 2. Dose response:Not done. All 16 patients had severe systemic anaphylactic reaction. Walnut allergic patients often have allergies to other tree nuts (Clark and Ewan 2003 ). Reaction to peanuts may be likely as with other tree nuts. Sicherer et al. (1998)  report that walnut was the most common tree nut allergy in peanut allergic patients. A single case of IgE cross reaction to coconut has been reported (Teuber and Peterson, 1999 ). Asero et al. (2002)  suggest that cross-reactivity between walnut and Rosaceae due to lipid transfer proteins is also possible as 16/20 Rosaceae (peach, apple, plum) allergic patients with sensitity to LTPs reported reaction with nuts. Many studies report allergy to "tree nuts". Allergy to walnuts was the most common of the tree nuts reported by Sicherer et al. (2001)  with 34% of the 1667 nut allergic registrants reporting walnut allergy. Similarly Sicherer et al. (1998)  report 26/54 nut allergic patients as walnut allergic. Symptoms, described as 89% involving the skin (urticaria, angioedema), 52% the respiratory tract (wheezing, throat tightness, repetitive coughing, dyspnea), and 32% the gastrointestinal tract (vomiting, diarrhea), were not associated with specific nuts. Clark and Ewan (2003)  described 1000 patients allergic to either peanut or at least one tree nut. 30 reacted most strongly to walnut. Considering only patients with a clear history with walnut, 94 (43%) could tolerate walnut. In an earlier study 8 out of 62 peanut or tree nut allergic patients were allergic to walnut (Ewan 1996 ). Systemic allergic reaction to coconut (Cocos nucifera) in 2 subjects with hypersensitivity to tree nut and demonstration of cross-reactivity to legumin-like seed storage proteins: new coconut and walnut food allergens. Cloning and sequencing of a gene encoding a 2S albumin seed storage protein precursor from English walnut (Juglans regia), a major food allergen. Identification and cloning of a complimentary DNA encoding a vicilin-like proprotein, Jug r 2, from English walnut kernel (Juglans regia, a major food allergen. Teuber, S. S.; Peterson, W. R.; Roux, K. H.; Sathe, S. K.
Removal of SDS by Non-Ionic Detergent is Necessary in the Optimization of IgE Immunoblots. A 12\Zamino acid peptide, residues 33-44 of the large subunit (QGLRGEEMEEMV), was strongly recognised by sera from 5 individuals out of 20, moderately by 6/20, weakly by 4/20 and not recognised at all by 5/20. Mutational analysis showed that RGEE (residues 36-39 of the large subunit) were necessary and E (residue 42 of the large subunit) important for recognition. A mixture of peptides did not inhibit all Jug r 1 specific IgE binding, demonstrating that conformational epitopes are also recognised (Robotham et al. 2002 ). Process, chemical, enzymatic:Jug r 1 belongs to the 2S family of seed storage albumin proteins. As these have four disulfide bridges, they tend to be relatively resistant to denaturation and proteolysis. Nature of main cross-reacting proteins:Jug r 1 exhibits a 46.1% identity with the Brazil nut (Bertholletia excelsa) methionine-rich 2S albumin seed storage protein allergen precursor, Ber e 1. Allergen properties & biological function:Jug r 1 is one of the 2S albumin storage proteins in walnut. It is an heterodimer composed of a large and a small subunit joined by disulfide bridges. Post-translational processing of the 142 amino acids long precursor results in the two subunits. Such processing is similar to that which takes place in castor bean, cottonseed, mustard seed, and Brazil nut 2S seed storage protein allergens. Allergen purification:Recombinant Jug r 1 has been expressed and purified both via a fusion protein and as a His-tagged protein (Teuber et al. 1998 ; Robotham et al. 2002 ). Robotham et al. (2002)  identify the small subunit as NPRRRGEGCREQIQRQQNLNHCQYYLR (26 residues) and the large subunit as RQHFRQCCQQLSQMDEQCQCEGLRQVVRRQQQQQGLRGEEMEEMVQSARDLPNECGISSQRCEIR (64 residues). Jug r 1 appears to be an important walnut food allergen; 12 of 16 sera from patients allergic to walnuts showed IgE binding to the 2S albumin seed storage protein precursor presented as a fusion protein (Teuber et al. 1998 ), which removed reaction to walnut extracts at 14, 10 and 4 kDa. Robotham JM, Teuber SS, Sathe SK, Roux KH. Linear IgE epitope mapping of the English walnut (Juglans regia)major food allergen, Jug r 1. Protein Family:PFAM PF00190; Cupin; 7S vicilin with an additional N-terminal region PFAM PF04702; Vicilin_N, which is removed on maturation. Allergen purification:A recombinant protein was expressed as a fusion protein with a glutathione-S-transferase (GST) domain. This was then purified on a column of immobilized glutathione (Bulk GST purification module, Pharmacia Biotech). 9/15 sera reacted to recombinant Jug r 2 (Teuber et al. 1999 ) inhibiting IgE binding to polypeptides at 44-47 kDa. N-terminal sequencing of the 44 kDa allergen band gave EEEQQRHNPYYFH, which suggests that the Jug r 2 precursor is cleaved after residue 172 to give a 48.3 kDa mature vicilin. Protein Family:PFAM PF00234; tryp_alpha_amyl; non specific lipid transfer subfamily. Process, chemical, enzymatic:Not known but many ns-LTPs are stable proteins, which tend to be resistant to denaturation and proteolysis. Nature of main cross-reacting proteins:ns-LTPs from Rosaceae fruits and other plants show IgE cross-reactivity. Allergen properties & biological function:ns-LTPs bind and transfer lipids in vitro but their in vivo role in plants is not clear. They have a protective function and form the PR14 family of pathogenesis response proteins. They may be involved in the transport of suberin in the formation of cutin. Other biochemical information:The IgE reactivity of sera to walnut extract could be 74-100% inhibited by peach ns-LTP in 11 walnut allergic patients (Asero et al. 2002 ).